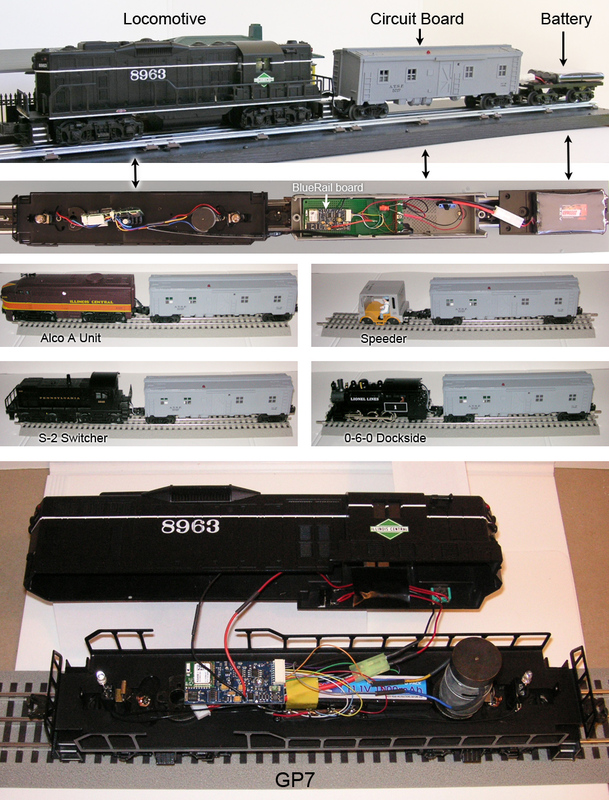 Bob H. Walker is a retired electrical engineer from Tarzana, CA (Motorola, TRW, Teledyne, Corning Glass) who has written over 40 published articles on O Gauge trains and train technology. Bob developed his own battery powered train control system to operate O gauge trains, and is the holder of 5 US patents in the field of solid state wireless radio communications. Many of his other articles introduced the use of robotic servomechanisms used in conjunction with the operation of model train layouts. Bob uses a BlueRail board to operate an O gauge GP7 which he has operated and tested under many conditions, gathering data (some of which will be shared below). The GP-7 is completely self-contained and battery powered. Bob has also installed a BlueRail board in a boxcar with a connection coupler that allows him to switch out various locomotives to pull the train. With this design he has operated an Alco A Unit, an S2 Switcher, a Lionel 0-6-0 Dockside and a speeder. A third car can be towed behind the boxcar housing a battery (when additional battery capacity is desired), creating a very flexible separation of motor power, bluetooth control, and power source. Because these boards use bluetooth low energy, the bluetooth module itself contributes very little to the battery drain.